From the ruins at Angkor to the beautiful beaches of the South - see Cambodia in more depth! 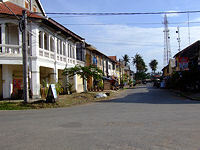 Arriving at Siem Reap, Cambodia, our Cambodia guide will meet you and transfer you to your hotel. After lunch at a local restaurant, take a boat trip & enjoy the wonderful views of Tonlesap Great Lake, and visit the beautiful Phnom Krom temple by the lake. Evening dinner is taken at the Apsara restaurant with traditional Cambodian dance performances on stage. Overnight in Siem Reap. This morning we set off by road in the direction of Phnom Penh, visiting on the way a very fine ancient bridge and stopping for lunch at a lakeside restaurant, After lunch we visit Phnom Santuk before checking-in at the Sambor Village hotel. This morning we leave Kampong Thom by road, visiting on the way Phum Prasat before stopping for lunch at a local restaurant in Kompong Cham. After lunch we visit Wat Nokor before finally driving into Phnom Penh to our hotel for the night. Today we we take a city tour of Phnom Penh, including the Royal Place, the Silver Pagoda, the Raung Damrei Museum, the National Museum of Fine Arts, the Independence monument and markets. After lunch, we visit the 'S21' Toul Sleng Museum of Genocide and Cheung-Ek Killing Fields. This morning we set off toward Takeo, visiting the beautiful Angkorian temple of Tonle Bati and hilltop pagoda of Phnom Chisor. After lunch at a local restaurant (we recommend the curry lobster at Restaurant Stung Takeo! 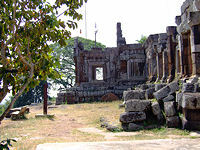 ), we take a boat to Angkor Borei, then return to the car and complete the drive to Kep. 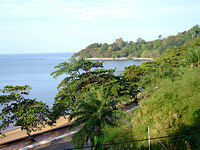 Kep is a beautiful and quiet seaside settlement where the elite of Cambodia built their holiday houses before 1970. Now, many fine houses can be seen fallen into dereliction, although the area is now being reborn. Today, our tour of Kep includes the Crab Market, pepper plantations & caves (Kampong Trach) etc. Lunch at a local seafood restaurant. In the morning we drive to Kampot province. On the way we see the cave at Phnom Sasear, also known as the “White Elephant cave” then continue to the cave of Phnom Chhork and then drive to Kampot & transfer to hotel. 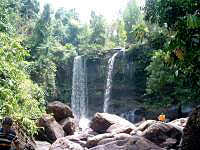 In the afternoon we explore the Tekchhou waterfalls and later in the afternoon we take a sunset river cruise from Kampot down to the sea. 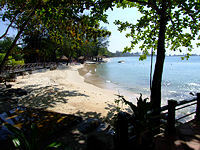 Today we drive to Sihanoukville and check in at our hotel for a stay of 4 nights. At leisure until it is time to drive back to Phnom Penh in the afternoon & catch your return flight in the evening.